Zark and The Quest for Patterns was just re-released by Maxis as part of a "2 for 1" package, along with a new companion title, Zark and the Search for Symbols. In this the original title, Zark - the leader of a group called the Night Team, goes with the user on four different adventures, each of which requires pattern recognition. We expected to see the mundane patterns of our early learning years: dot dot dash, circle square circle, or small medium large. They're here, but they're accompanied by some patterns we wouldn't have thought of, like: musical patterns, stylistic patterns in classical artists' works, and number patterns. Each of the four adventures also includes versions at three different difficulty levels, accomodating a wider range of kids, as well as offering growth potential. Zark installed easily, with only one configuration change required -- resetting the video driver on our test machine to display only 256 colors. 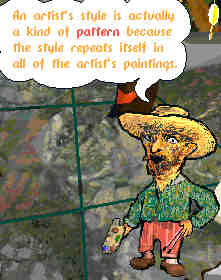 The Quest for Patterns offers a very good balance of fun and education. Younger children (5 and 6) were interested in the plots, which generally involved rescuing, saving or capturing of good guys and villains, respectively. Older children (7 and 8) found the puzzles still challenging. We found that many children preferred using the program in the company of an adult, who could help if they became stymied. Maxis has done an excellent job of illustrating patterns in different facets of our lives, and weaving problem solving into a captivating series of adventures. The program has a few idiosyncrasies which were bothersome to some of our reviewers. For example, a child who wants to move directly into solving the pattern is forced to "mouse around" (Zark's term for explorative clicking on objects in a scene) before being allowed access to the problem. This would be tolerable if the resulting exploration uncovered really neat things, but that's not the case here. Another concern several of our reviewers noted, was the delay between screens that occured when the program went to the CD for an update. 386DX minimum, 486 recommended, Windows 3.1 or above, 8 MB RAM, CD-ROM drive, SVGA 256 color monitor, mouse. Windows 95 compatible. Copyright © 1996Knowledge Share LLC All rights reserved.